Body mass index (BMI) is an approximate measure of a person's weight in kilograms divided by the square of height in meters. BMI is used as a screening tool to indicate whether a person is underweight, overweight, obese or an ideal weight person for his/her height. 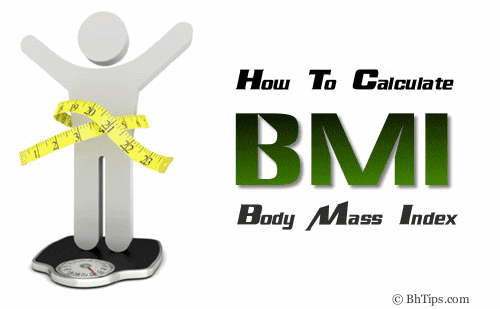 Let's learn how to calculate BMI simply at home. If you are an adult male then according to your weight and height the value of your body mass index should be in between 18.5 to 24.9. Value of BMI less than 18.5 or higher than 25 is considered abnormal. If you are an adult female then the value of your BMI should also be in range of 18.5 to 24.9. Value of your BMI within this range is ideal for you but value of BMI less than 18.5 and above than 25 is abnormal for you and really requires a proper attention. According to the values of BMI, let's check the weight status with possible health risks. A person with BMI less than 18.5 is considered an underweight person and he/she must try to gain some healthy weight by eating healthy foods. 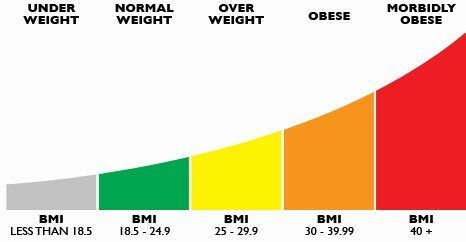 A person with BMI more than 25 is considered overweight but BMI with value above 30 is considered an obese person with risk of many health problems. An obese person with BMI more than 40 is considered morbidly obese person with increased risk of many health problems including Coronary heart disease, dyslipidemia, high cholesterol, diabetes type 2, gallbladder disease, hypertension, osteoarthritis, stroke and various kinds of cancers including endometrial, breast, and colon cancer. Obese persons should need to make many dietary changes in their diet plan and should adopt a habit of regular exercise to reduce obesity otherwise they may suffer from many fatal diseases.